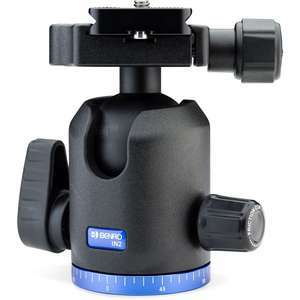 The IN2 Tripod Ballhead from Benro features an Arca-type compatible quick-release system with an included PU60 QR plate. This head can hold up to 10kg and weighs just 0.41kg. A large locking knob controls the ball's motion and the 360° panning, and a separate knob adjusts the friction control. Also a numbered scale on the base allows you to accurately repeat pans, and a bubble helps ensure that the head is level.